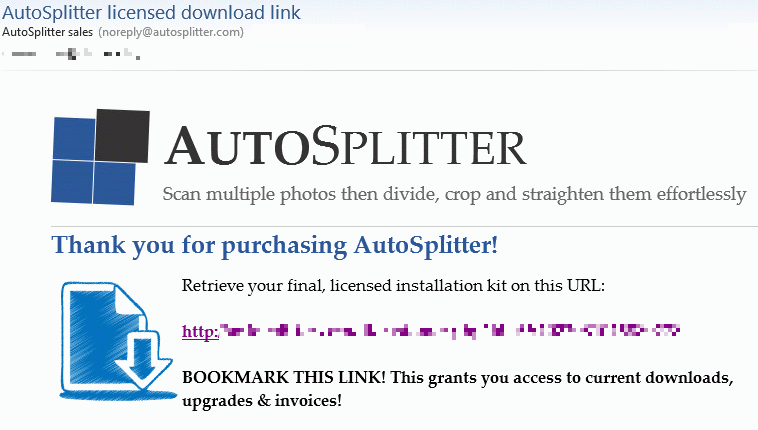 Buy multiple photo scanning software AutoSplitter. Already purchased? Recover your account here. New customer? Scroll down or click here to register. AutoSplitter offers a fast and effective method to scan your family photograhps. You can finally secure these precious photos and archive them to your computer, to a CD or DVD. Show these pictures to your relatives, be proud of your digital album! Just a final step to make: look at the available licensing options and decide which is the best for you. Licensing options are listed below. All licenses are household licenses: all Windows PCs in your household may run a copy. Automated instant delivery. You will receive a download link to the licensed version in your email used for registration. All licensing options provide indefinite access to the purchased version. Pay with your PayPal balance or use any major credit card or eCheck. Use major credit cards or your PayPal balance. Continued development of the product. Make photo scanning even faster and easier with new features. Alleviate poverty. Part of AutoSplitter's revenue funds microloans in developing countries to help people help themselves. Join Kiva to make a difference.